This print was issued as an extra supplement to the Illustrated London News, Feb. 24, 1883. Turner's painting is now better known as "The Wreck of a Transport Ship" and is owned by the Gulbenkian Foundation, Lisbon. 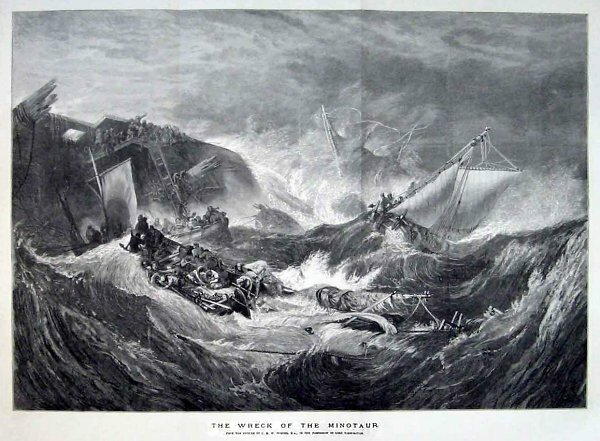 The painting was completed around 1810 when the Minotaur's wreck was headline news and feelings were probably running high as a result of the Dutch failing to mount any rescue attempt. However, earlier sketches for the painting date from around 1805, so the Minotaur cannot have been the original inspiration for the composition. Apparently titles of paintings were changed quite frequently.